The bloggers at Arkansas Women Bloggers Unplugged show off their free Country Outfitter boots. 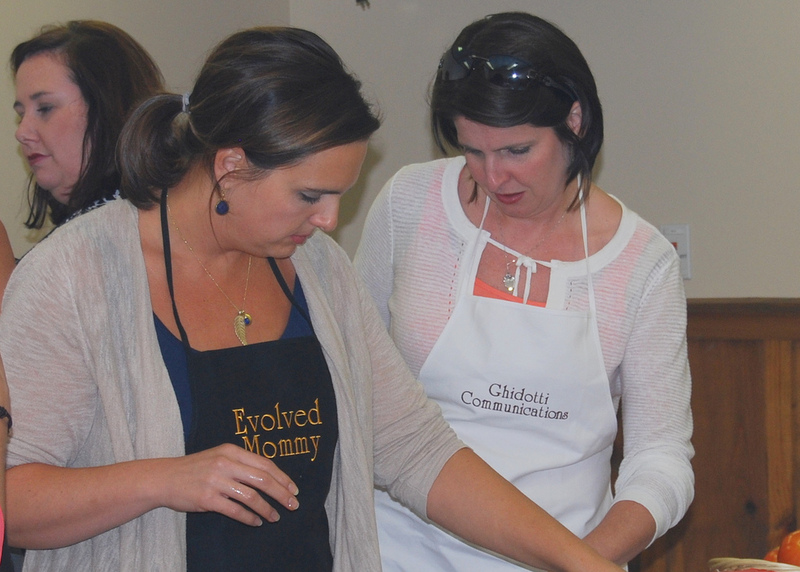 Stephanie McCratic, blogger at Evolved Mommy and the brainchild of the Country Outfitter blogger boot giveaway, participates in #FoodieFriday with the author Natalie Ghidotti of Ghidotti Communications. It’s no secret that pitching bloggers is much different than pitching traditional journalists. The days of editorial vs. advertising/promotion are quickly fading from memory. With the blogosphere, there’s a melting pot of traditional earned media, paid media and product placement. The lines are blurred, and public relations practitioners must determine what is appropriate, ethical and, eventually, successful for their clients. I recently participated in a blogger conference in my home state of Arkansas, where I witnessed firsthand an extremely effective and creative blogger outreach campaign. I wanted to share the ins and outs of this campaign because I believe it’s the perfect example of how a blogger pitch has transitioned into much more than just a mention of your client. The Arkansas Women Bloggers Unplugged conference featured a two-day event for about 70 women bloggers from across the state. I was honored to be a speaker (click here for a recap of our presentation) and to sit in on the many informative sessions and blogger fun that weekend. I also was representing an ice cream client that was a sponsor of the event and hosted ice cream socials during the breaks. My friend and colleague, Stephanie McCratic, was there wearing two hats as well. She is a well-known blogger in the state (find her at evolvedmommy.com) and represents her company, Acumen Brands, that runs a popular ecommerce site, CountryOutfitter.com (The growth of this site is a whole other story that is seriously fascinating that I’ll take some time to tell you some day). Stephanie launched an impressive campaign a few weeks prior to the AWBU event. She contacted each blogger attending the conference (with help from the conference’s organizers as a premier sponsor) to see if they wanted to participate in a giveaway/review for Country Outfitter. Each blogger was given a pair of boots for herself and a pair of boots to give away to a reader in exchange for two separate posts and a Pinterest pin about Country Outfitter (see the initial post here). The bloggers were provided a special link that let them choose their preferred boot style (up to $150). Once the conference began, Country Outfitter worked with the conference organizers to plan an amazingly fun social event for Saturday evening – a wonderful BBQ spread, beautiful outdoor setting and the bloggers’ boots ready to wear. Everyone changed into their boots and took pictures in front of the country chic setting, complete with a Country Outfitter sign prominently in the shot. I’ve never seen so many girls go ga-ga over boots. It was so much fun as everyone scrambled to find their boots, compare looks with everyone, and then take literally 2,000+ pictures of each other! Oh, and then there was the boot-scooting dance lessons in our boots, of course. Brilliant marketing! And what do you think happened with all those photos? They were posted on blogs, shared on Facebook, tweeted on Twitter, filtered on Instagram, posted on Pinterest and tagged with County Outfitter. Genius. And that doesn’t even include the eventual blog posts and more blog posts and, yes, even more blog posts. Bloggers went nuts over boots, and their readers did too. According to McCratic, the SEO benefits for CountryOutfitter.com have been immeasurable. The company is already experiencing links move search terms in a way that has a very tangible effect on revenue. Just the Pinterest angle alone boosted revenue from Pinterest by 270 percent! Jacklyn went all out with her content, taking the boots giveaway and making it all her own. Her series, Refashioned Roots, featured innovative wardrobe refashions to suit her new Country Outfitter boots. There was this post where she made cute, fashionable shorts out of a $2 Goodwill blanket (really, I’m not lying). Then there’s this one where she takes an oversized sweatshirt that would look good with your SpongeBob pajama bottoms and makes it into a slim shirt perfect for the club scene. And, finally, there’s this post that features a recap of all the adorable fashion statements Jacklyn is making with her new boots. Country Outfitter says the post from local Arkansas company Petit Jean Meats was its most successful (of course, they did throw in a delicious ham to sweeten the deal). The boot giveaway was paired with a spiral ham for the perfect holiday retail kick-off. Alison was another favorite for her dedication to making the product look beautiful. Alison wrote several posts about her new boots – each with photography that really captured the essence of boots in a casual, fun, hip way. There was even this awesome post by photographer/blogger Whitney Loibner, who invited some of the bloggers to a photo shoot where she took pictures of all their boots. She even took a photo of the girls with all the sponsor products from the conference. Note my client’s carton of Yarnell’s ice cream! J I can tell you these pictures made the social media round in Arkansas (at least twice), feeding more and more perfectly targeted traffic to CountryOutfitter.com. So what is the take away from all of this? A few things …. Bloggers love to make their readers part of the story; this usually means giving them something. And not just anything – but something that fits their blog and their readers’ interests. Personal relationships with bloggers matter. Stephanie knew a lot of these bloggers personally. She herself is a blogger, so she knows what bloggers want. She is one of them. She’s a friend. She’s a trusted marketer. All of this spells success for the brand. Follow-up is key. Stephanie made sure to follow-up with everyone that received a pair of boots to help with content and photos if needed. And, more importantly, she closed the deal by asking when the post would be published. Bloggers = Influence. This particular group has lots of influence with Country Outfitter’s key audience: women who shop online. If you do your research and do it right, you can begin building relationships with key bloggers who automatically launch your product to the top of their readers’ lists of trusted brands. Boots are totally in. They aren’t just for cowboys anymore. Stephanie hooked me up with an awesome black pair of Nocona boots that I will surely wear to the PRConsultants Group conference in Kansas City in January. I predict rave reviews. Connecting with bloggers in powerful partnerships that create a win-win for the brand, the blogger and the reader can be extremely rewarding. But it doesn’t come easy. Blogger relationships and blogger campaigns such as the boots giveaway take time. They don’t happen overnight, but that’s OK. The journey can be seriously fun. Just take a look here and you’ll see what I mean.